"As he's screaming "Police! Police!" Officer Krauss fires from a football field away at a person that he cannot identify"
The family of Detective Jacai Colson is suing the officer who killed their son in friendly fire. They're also suing Prince George's County. News4's Meagan Fitzgerald has the story. The family of a black undercover detective fatally shot by a white officer during a shootout in Maryland in 2016 has filed a wrongful-death lawsuit. 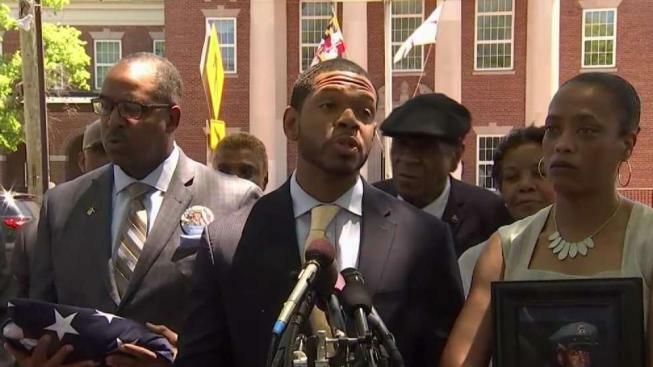 The family of Prince George's County police detective Jacai Colson is suing officer Taylor Krauss and the county, the family's lawyer announced Thursday, more than two years after Colson's friendly-fire death. Krauss and Colson were among the officers who responded to gunfire outside Prince George's County police headquarters in the Palmer Park area of Landover, Maryland, on March 13, 2016. Michael Ford, 22, is accused of opening fire outside the police station after he told his brothers he wanted to attack police. His brothers filmed the attack. According to the lawsuit filed Monday, Krauss shot Colson after Ford was taken into custody. The plaintiffs say Colson held his badge and verbally identified himself as an officer. The family of Officer Jacai Colson is suing the Prince George's County police officer who killed him during a shootout. They're also suing the county. The Colson family's lawyer, Jason Downs, held a news conference Thursday afternoon. Here are his full remarks. "As he's screaming "Police! Police!" Officer Krauss fires from a football field away at a person that he cannot identify. That third and fatal shot killed Detective Colson," the Colson family's lawyer, Jason Downs, said at a news conference Thursday afternoon. As he spoke, Colson's mother stood next to him carrying a photo of her late son in uniform. The slain officer's father held a folded American flag. Downs said Krauss fired at Colson three times: through a wooden fence, from behind a brick wall and as Colson ran. He fired from about 95 yards away, the lawyer said. The lawsuit asserts Krauss should have recognized Colson, as they were assigned to the same division and sat at connecting desks. An investigation into Krauss's actions was opened, but a grand jury declined to indict him. He remains on the force. He declined comment to The Washington Post through the police union. The Colson family is asking for $75,000, according to the county. 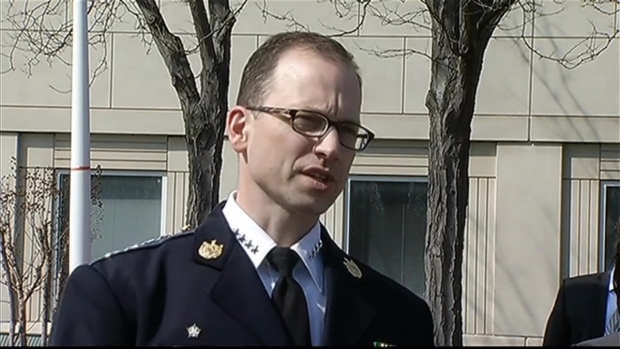 Prince George's County Police Chief Hank Stawinski gave reporters an update on the investigation into the shooting death of Officer 1st Class Jacai Colson. They did not want to file a lawsuit, Downs said. "They wanted to get to the bottom of what happened to their son, and they were disappointed and outraged at the fact that there were no criminal charges filed despite all of the evidence that we just talked about. They were outraged," he said. 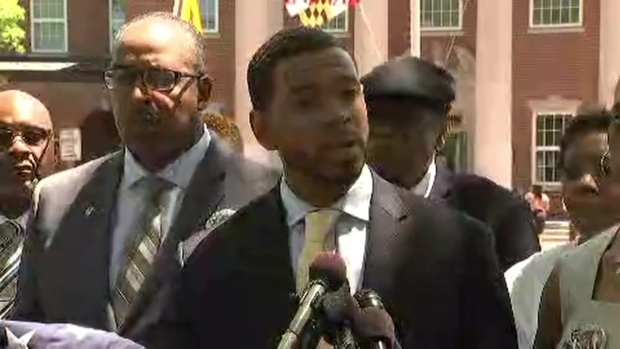 The Prince George's County State's Attorney's Office says they have been transparent with the Colsons. "We brought the Colson family in, spent about eight hours with them one day, going through all of the evidence that we had surrounding the death of their son — walked them through all the video evidence, all the audio evidence, you name it, we went through it with them. Because we felt we owed it to them to be able to answer their questions," spokesman John Erzen said. Police chief Hank Stawinski previously said Krauss incorrectly thought Colson was a danger. Officer Jacai Colson was killed Sunday near the District 3 police station in Palmer Park. News4's Darcy Spencer and Mark Segraves have team coverage on the investigation. During the exchange of gunfire that followed, Colson, an undercover narcotics officer, was dressed in plainclothes and stepped out of an unmarked car. Police have said Malik Ford, 21, and Elijah Ford, 18, helped their brother Michael before and during the shootout and used their cellphones to record video of the gunfight. Elijah Ford allegedly recorded his brother's "last will and testament" minutes before Malik Ford drove them to the police station. The mother of a Prince George's County officer killed in an attack on a police station gave mourners a look into her son's life during his funeral on Friday. The police chief called Ofc. Jacai Colson his "hero." 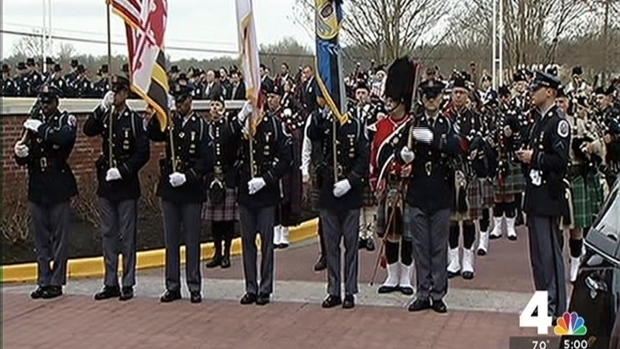 County Bureau Chief Tracee Wilkins has more on the emotional tributes from Upper Marlboro, Md. Michael Ford is set to go on trial in October. He is facing multiple life sentences. His brothers pleaded guilty to their roles in the shooting.